The state of Kentucky has county, state, and federal jails and prisons that all fall under state jurisdiction. Currently, there are 12 penitentiaries and complexes located throughout the state whose mandate is to protect the citizens and communities of the state by providing secure environments for inmates and officers. Arranging state facilities in this manner allows services to be clustered for best management of the offenders who may need services directed toward juvenile offenders, women, health needs, or community transition. Some, like Bell Country Forestry Camp house offenders who can work on outside release. Others, like the Kentucky Correctional Institution for Women have gender segregated cells and dormitories. Kentucky currently has 3,247 correctional officers working with over 20,000 incarcerated offenders. In the next decade, state predictions show that the number of correctional officers is going to grow by 5% or to 3409 roles. This growth, coupled with retirement and career moves, means that the Kentucky Department of Corrections is actively recruiting new hires. 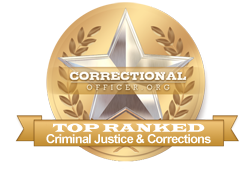 For more information about the field of corrections in Kentucky, keep reading. Kentucky Wesleyan College ranks 1st in our latest rankings with sixteen students completing programs in criminal justice out of a total 294 graduates in the 2012-2013 school year. Saint Catharine College ranks 3rd in our latest rankings with eleven students graduating from programs in law enforcement administration out of a total 306 graduates from the 2012-2013 school year. University of Pikeville ranks 4th in our rankings with 18 students graduating from programs in criminal justice out of a total 546 graduates. Lindsey Wilson College ranks fifth in our rankings with thirty-eight students graduating from programs in criminal justice out of a total 1,292 graduates from the 2012-2013 school year. University of Louisville ranks sixth in our rankings with 267 students completing programs in law enforcement administration out of a total 9,754 graduates in the 2012-2013 school year. Gateway Community and Technical College ranks 7th in our rankings with 72 students graduating from programs in law enforcement administration out of a total two thousand students in the 2012-2013 school year. Hopkinsville Community College ranks 8th in our latest rankings with 67 students graduating from programs in law enforcement administration out of a total two thousand graduates from the 2012-2013 school year. Kentucky State University ranks 9th in our rankings with sixteen students completing programs in criminal justice out of a total 608 students. Campbellsville University ranks 10th in our rankings with twenty-eight students completing programs in criminal justice and law enforcement administration out of a total 1,288 students in the 2012-2013 school year. If applicable, military discharge "Under Honorable Conditions"
Having met all the above qualifications, along with successful interviews proving the candidate to be of good moral character, applicants will have a probationary hiring period as a trainee. Trainee corrections officers will continue their specialized training at a state facility. Upon successful completion of the final training portion, he or she will be awarded the status of correctional officer and be assigned a duty location. One of the ways that the state of Kentucky serves and supports correctional officers is through strong growth and salary opportunities throughout the state. As such, the median income for front-line correctional officers throughout the state is currently lower at $27,800 than the national median income at $39,800. However, and according to the occupational profile for the state of Kentucky found at http://www.careerinfonet.org/occ_rep.asp?next=occ_rep&Level=&optstatus=011000000&jobfam=33&id=1&nodeid=2&soccode=333012&menuMode=&stfips=21&x=48&y=13 and published by CareerInfoNet.org, state and national trends predict a 25% and 5% increase in correctional officer jobs by 2022 respectively, indicating that state growth is very rapid. For residents of Kentucky this rate translates into 380 job openings per year. The table below lists career information obtained from the BLS for correctional officers in Kentucky. The table is sorted by total employment, with the largest metropolitan areas listed first.